The bag is gathered at the top, and a wide piece of cloth is used to tie the top of the bag shut. 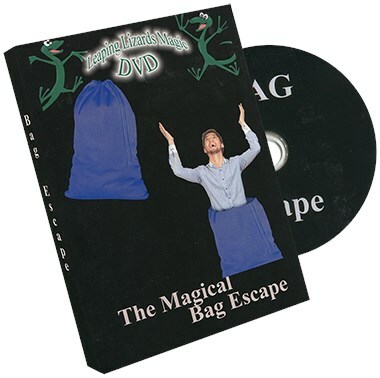 The top end of the bag is then held by the spectator as a tube curtain is raised around the bagged performer. The top of the bag is ALWAYS in view however, as i t is held by the spectator and droops out over the side of the front. A fast three count and the bottom of the bag comes flying over the top of the curtain! At the same instant, the curtain is dropped and the performer is standing there, having almost instantly penetrated the bag! The spectator and performer step forward, and untie the bag. The spectator is invited to reach inside making certain all the seams are still sewn and the bag is solid (It really is!) and INSIDE the bag is the borrowed jacket, prop or garment that went in the bag at the start with the performer. This cements in the audiences mind that this is the same bag, it is solid, and somehow the performer penetrated the fabric while leaving the other item behind! The bag can even be sent back to the seat with the spectator, There is nothing to find! This illusion can be seen on large stages, DOES require two people- the performer and his trained assistant, and can be purchased with or without the curtain.